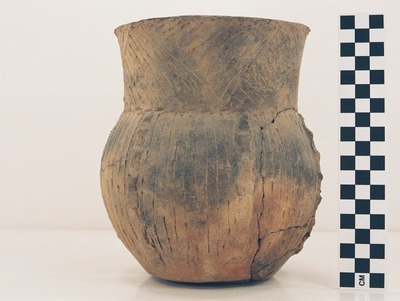 "41CS14, Burial 4, 6995" by Timothy K. Perttula and Robert Z. Selden Jr.
DECORATION: Opposed incised lines on the vessel rim and six panels of vertical incised lines on the vessel body that extend on the body to near the base. Each panel is separated by a vertical appliqued fillet. Pease Brushed-Incised vessel from Burial 4 at the Knight’s Bluff site.